Byzantine. The Empire of Trebizond. Manuel I, AD 1238 to 1263. Silver Asper. The Emprire of Trebizond was established in ad 1204 after Constantinople fell to the Crusaders. It started off strong, but over time lost much of it's power and only survived at the whim of the Ottomans who surrounded them, and in AD 1461 was eventually encorporated into the Ottoman Empire (either years after the fall of Constantinople). Denomination : Silver Asper. Date : AD 1238 to 1263. Size : 22.5 x 23.3 mm. Weight : 2.74 grams. Reference : Sear-2601 variety (there are many minor varieties of this type). Grade : gVF/VF with only minor weak areas (nice for one of these). 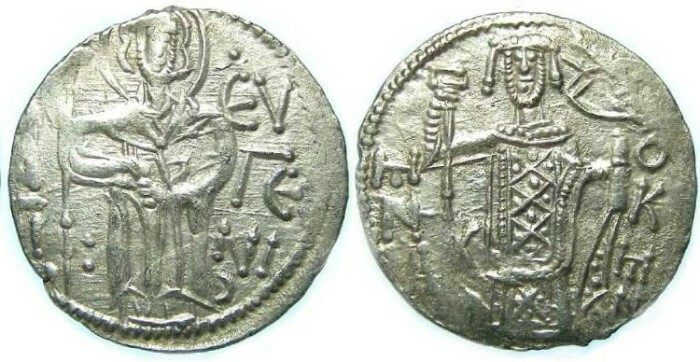 Obverse : Saint Eugenius standing forward holding a long cross, with OAGI EVGENI in several lines to the sides. Reverse : Manuel I standing forward holding a labarum-headed sceptre and akakia, with MNLOKH split at the sides. An Akakia is a scroll-like object, with knobs at the ends, which was used as a symbol of Imperial authority during the later Roman and Byzantine periods.